I don’t know if I need permission to use that photo?! I’ve really enjoyed reading posts related to banned books. Heck, I’ve enjoyed reading quite a few of the books on the various lists. I enjoyed the way Alice Walker, Zora Neale Hurston, and Toni Morrison weave a story through beautiful words. I’ve enjoyed the imagination of Shel Silverstein and Maurice Sendak. I have dreamed of living in the worlds created by J.K Rowling and J.R.R. Tolkein. I can’t imagine not reading those books and experiencing those stories. Some times I understand why people don’t find a book appropriate, that’s fine you don’t have to read it. There are quite a few of those books that I will not read. That’s my right. 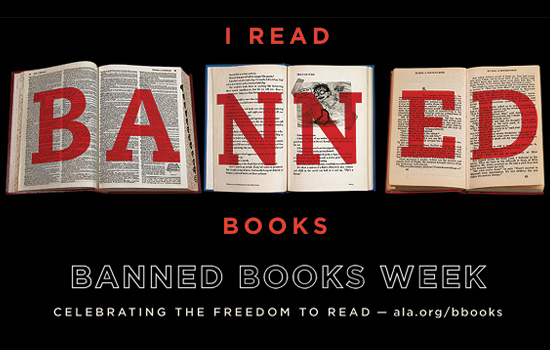 And that is at the heart of banned book week. We have the right to choose what we want to and don’t want to read. It’s called the First Amendment (Free speech). There’s a flip side to Banned Books. The lists are full of edgy books. Books that may be socially provocative with language, sexually explicit, violence, or alternative life choices. Yet, on none of those lists have I seen the Bible. Public schools around the country have tried, and in some instances succeeded, in banning Bibles in school. I’m not talking about leading the class in reading the Bible, I’m talking about students reading their Bible during free reading time. Hmmm. The Bible may not be provocative and life changing like some of the other books…wait yes it is. It must be or why would it be banned in 52 countries. That’s one dangerous book! When you sit down and read your favorite banned book, don’t forget to allow others that same choice. This entry was posted in Read and tagged banned book week. Bookmark the permalink.